With the end of Mueller’s inquiry, our long, national hallucination is finally over. But the damage done by neocons and liberal conspiracy theorists is just beginning. So ends one of the more incoherent political scandals in modern memory. After two long, breathless years of investigation, accusations, leaks, scoops, walk-backs, and wild conspiracies, the main findings of Robert Mueller’s investigation into the Trump-Russia conspiracy were finally released on Sunday. As most anyone reading this now knows, its conclusions are devastating, though not for the reasons many of Mueller’s fans had hoped. The excerpt of the report included in attorney general William Barr’s summary reads thus: “The investigation did not establish that members of the Trump Campaign conspired or coordinated with the Russian government in its election interference activities.” Placed just after a list of statistics outlining the massive scope of the investigation — thousands of subpoenas, many hundreds of search warrants and witnesses interviewed, and the like — the message seems clear: there is nothing here. There’s certainly a chance that Barr, a Trump political appointee, summarized the findings in such a way as to be most politically advantageous for the president (though he did also point out that Mueller did “not exonerate [Trump]” over the charge of obstruction of justice). And many will continue to hang on Mueller’s wording — “did not establish” — to insist the jury is still out. 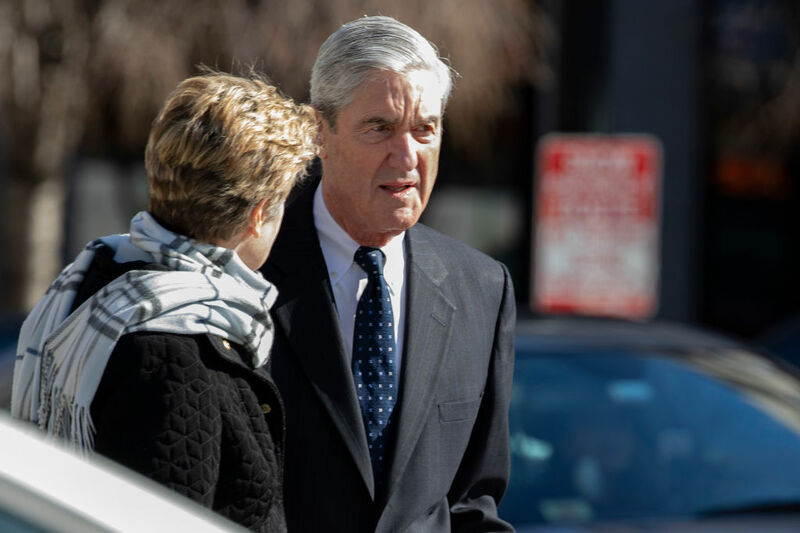 But those still holding on to a flicker of hope that Mueller will emerge on horseback, thick stack of papers in hand, with details and conclusions running counter to Barr’s summary need to get a grip. If there was something there, it would have leaked a long time ago. It’s hard to overstate how devastating this all is. This is the culmination of what some declared the “crime of the century.” The idea that Trump “colluded” with Russia was considered virtually a foregone conclusion for the past two years by the majority of the political and media class. It fed a constant stream of breathless, often irresponsible and misleading, media coverage, the definitive account of which was written up by Matt Taibbi and is worth reading in full. And until an approaching election concentrated Democrats’ minds and brought them to their senses in last year’s midterms, it served as the foundational element of the otherwise incoherent “resistance” to Trump’s presidency. It’s not as if there weren’t voices warning against this. Figures like Taibbi, Glenn Greenwald, Aaron Maté, Michael Tracey and many more have faced attacks, ridicule, and, too often, baseless smears and accusations for criticizing media coverage of the scandal and calling for skepticism and caution. And it’s not as if there haven’t been signs that the theory would fall short of reality. One of the earliest Russiagate scandals — Michael Flynn’s secret contact with the Russian ambassador in December 2016 — swiftly turned out to have actually been about protecting Israeli interests. Congress learned early on that the fiercely anti-Trump FBI official Peter Strzok had privately admitted about the investigation that “There’s no big there there.” Successive Trump associates were criminally charged, not for making secret deals with the Kremlin, but for other, sometimes tangentially related, crimes, including lying to investigators. Detail after sensational detail of the infamous Steele dossier went unproven or was proven wrong, such as former Trump attorney Michael Cohen’s alleged clandestine trip to Prague. As the Mueller investigation approached its end point, even media outlets that had spent years hyping the story started publishing skeptical accounts about the impending release of its findings. Michael Isikoff, the journalist who literally wrote the book on the scandal, publicly doubted anything would turn up. A few months later, both Democrats and Republicans on the Senate Intelligence Committee were forced to admit that after two years of intense investigation, they had found “no direct evidence” of a Trump-Russia conspiracy. As disappointment loomed, some of the conspiracy theory’s biggest boosters already started shifting the goalposts. How could they not? A cornucopia of media and political figures have staked their careers and professional reputations on its veracity, many have made fortunes off book deals on the scandal, some of which are now no doubt on the rocks. Two years on, with talk of “collusion” suffusing the political discourse, it’s easy to forget that the alleged collusion was never really the heart of the matter. Indeed, the Clinton campaign itself “colluded” with Ukraine’s far right-enabling government during the election, and foreign powers like Saudi Arabia and Israel regularly “collude” with both major parties out in the open. Rather, the core concern that animated the last two years of anti-Russian panic was the notion that Trump was under the influence (or, depending on who you listened to, under the direct control) of a neoliberal, authoritarian petrostate in the form of Vladimir Putin’s Russia. This worrying idea, though unproven (though in a different sense somewhat true), was one that led preeminent liberal columnist Jonathan Chait to spend thousands of words wondering if “Trump has been a Russian asset since 1987,” less than two decades after writing column after column confidently asserting there were WMDs in Iraq. Unfortunately Trump’s actual presidency swiftly turned this theory into a joke. In power, Trump has been the most aggressively anti-Russian president since the Cold War. Yet nothing he did, no matter how hostile to the Kremlin — from sending arms to Ukraine to bombing Syria to perpetuating a new nuclear arms race to trying to knock off a Russian ally in Venezuela — could make the establishment budge from the certainty that, somehow, some way, this was all part of a cunning plot hatched by Putin. When Trump recently withdrew from the Reagan-era INF Treaty, prominent liberals somehow determined that this, too, was a “favor to Putin.” Russia might have found Trump a grave disappointment, but he could never be aggressive enough for a US media that declared US withdrawal from the Middle East a “reward” to Trump’s supposed master. No one can be faulted for initially entertaining the theory. Trump’s ramshackle campaign, like his presidency, was an open invitation for influence peddling and corruption of all kinds, particularly given Trump’s overseas real estate interests. It’s clear the Russian government made attempts to aid or even infiltrate Trump’s campaign, though to what end is still not clear (it’s hard to believe the Kremlin foresaw Trump’s victory when even the candidate himself didn’t, and various reports have the motive as anything from sticking it to Clinton to getting revenge for the release of the Panama Papers). Meanwhile, Trump and his associates did seemingly everything they could to make themselves look as guilty as possible. But rather than treat these developments with measured skepticism — there was, after all, always a possibility that Trump and his associates were amateurishly lying and obstructing justice to tamp down a scandal that was less criminal than embarrassing and politically damaging — the political and media establishment largely threw caution, care, and, sometimes, professionalism out the window, expecting their conclusions would eventually be proven entirely right. The fact that less than two decades ago denizens of these same journalistic quarters — in some cases the exact same individuals — had been duped by sensationalized, intelligence agency-fed stories about Iraq and weapons of mass destruction apparently gave them no pause. Instead of removing Trump from power or even weakening him — the real purpose of all this — those who pushed the Trump-Russia scandal have instead handed him an entirely unearned victory. It’s not clear how politically valuable it will prove to be in the long run; Trump’s policies, after all, have been disastrous for the vast majority of voters, and his historic unpopularity has little to do with a scandal that obsessed only a narrow sliver of the US public. But Trump, who in 2016 ran disingenuously against the establishment before spending his entire presidency coddling it, can now say he’s been vindicated. He’ll point to the last two years as an organized conspiracy by the Democratic establishment, in concert with the media, to destroy his rebel presidency, just as he’s been saying all along. Perhaps it won’t work. But the Democrats, who have only recently begun learning to oppose Trump on anything other than Russia-related nonsense have a lot of catching up to do. Meanwhile, it’s hard to overstate the damage the media has done to itself, an ominous development when, coming off its role in the Iraq War, its public standing remains low. After spending the last two years both celebrating itself and panicking about Trump’s hostility to press freedom, the media has now appeared to confirm every ungenerous right-wing talking point about itself, and it has done so when press freedoms are increasingly under attack, not from Trump but from the establishment that supposedly hates him. This is a grave unforced error whose exact significance for the press we likely won’t know for some time. Russiagate and the Mueller investigation do have another legacy, however: facilitating an alarming rightward shift on foreign policy and national security. The scandal may have failed to remove Trump from office, but it’s been expertly used by its promoters to rehabilitate some of the worst actors in these fields, and to advance the aggressive, militarized foreign policy for which they’ve long jockeyed. In this climate, anything less than bellicose hostility to Russia has been cast as criminal and treasonous. The mere idea of Trump holding a summit with Putin — an entirely routine step for the two leading nuclear powers, one that was unusual only in how long it took to happen under Trump — sent the media and politicians into a hysterical frenzy the likes of which have not been seen since since the days of the “war on terror,” with prominent figures accusing Trump of “treason” and calling for a cyberattack on Russia that would have destroyed countless innocent people’s lives. In fact it may well have been the constant, hyperbolic accusations that Trump was a Russian “asset” or Manchurian candidate directly controlled by Putin, casually trotted out in the pages of mainstream news publications and on network news shows, that led Trump to overcompensate, sending arms to the neo-Nazi-infected Ukrainian government for the first time, a step Obama spent years resisting. Such pressure may well have also pushed him to withdraw from successive Cold War-era weapons treaties and to scuttle further talks with Putin, ominous developments that any future Democratic president must urgently reverse. “Russiagate,” and Trump more generally, has been very good for the CIA. With a figure as reviled as Trump attacking it, the agency — its reputation damaged thanks to its involvement in torture and role in selling the Iraq War — used this martyrdom to renew its public standing. Same with the FBI. These agencies, both of which have perpetrated the overthrow of democratically elected governments, abetted war crimes, and at times carried out violent campaigns to stamp out domestic, left-wing dissent — have rebranded as the only things standing between democracy and Russian-made tyranny. For the first time since at least 2002, the CIA enjoys a higher approval rating among Democrats than Republicans. Cable news has increasingly come to resemble state media, with former national security officials, some of whom have lied under oath, and right-wing ex-government officials becoming paid talking heads for news channels. Some of those officials, as hostile to press freedom and civil liberties as Trump, have become minor media personalities, making far-fetched insinuations about Trump and Russia to cheers and applause from liberal audiences. A small number of journalists have raised alarm about this, to little avail. The Trump-Russia scandal has been particularly profitable for MSNBC, the “liberal” news network that has begun skewing older, whiter, and more right-wing under Trump. But no figure better represents the network’s transformation than Rachel Maddow, who rode the scandal to sky-high ratings on the back of wall-to-wall “coverage” of what even the Washington Post has termed conspiracy theories about Putin’s alleged control of Trump. Maddow, who once upon a time wrote a book about the US’s unsustainable global military presence and ran segments excoriating the GOP for wanting to remain in Iraq, has become one of the most watched, most warlike voices on television. Whether on Syria, North Korea, Afghanistan, or Syria again, Maddow has adopted conspiratorial speculation and mouthed the same kind of pro-war and anti-diplomacy talking points she once derided, in between bouts of Glenn Beck-style fake crying for the sake of Robert Mueller. When Trump floated pulling US troops from South Korea — thus reducing the very sort of military overreach Maddow had once spent her career attacking — this played into Putin’s hands. So did pulling troops out of Syria, of course, as well as conducting diplomacy with Russia. It’s a strange coincidence that any path leading away from military escalation was a Putin plot. Perhaps most alarming for anyone reading this is the way Trump-Russia has been weaponized against the Left, as commentator after commentator warned it would. It took little time for the Washington Post to join a neocon-led effort to smear anti-establishment media outlets as being in some way compromised by Russian influence. The Daily Beast charged that Putin had “cultivated dupes, fellow travelers, and purblind fools among plenty of American progressives,” who “whether by accident or design” had “facilitated” Trump’s rise. In one of the more galling pieces of misreporting on the scandal, MSNBC’s Ari Melber joined a chorus of voices falsely claiming Bernie Sanders’s campaign was helped by Russia, largely on the back of a single quote he misrepresented and that his team never checked (the segment, of course, is still up on MSNBC’s site). This idea remains an article of faith for some high-profile liberals. When Mexican president Andrés Manuel López Obrador began his rise, commentators quickly began insinuating he was assisted by Russia. One could go on and on. There’s a reason the Left has been warning about McCarthyism 2.0. This anti-left hostility manifested itself in growing efforts at censorship, too. Censoring the web has been a goal since at least the years of the “war on terror,” with debate raging about the efficacy and propriety of scrubbing videos of al-Qaeda and ISIS to prevent radicalization. The panic over Russia, driven in large part by Mueller’s own investigation, has helped foster a worldwide push to empower governments and corporations to crack down on internet speech, a push that has more often than not targeted anti-establishment voices and outlets on the Left whose critiques of US foreign policy happen to overlap with those of Russia or other rival powers. At the same time, some of the country’s most extreme and discredited right-wing figures have ridden the Trump-Russia wave to rehabilitation. Max Boot, a neocon who believes the US should set up an outright, British-style empire, used the Trump-Russia scandal to land a column at one of the country’s most prominent newspapers, where he recently called for a foreign policy modeled on the Native American genocide. Bill Kristol, who like Boot helped fan the flames for the Iraq War nearly two decades ago, has been embraced by liberals for his opposition to Trump’s friendliness to Putin, using his rehabilitation to attack left-of-center outlets and commentators deviating from establishment foreign policy. David Frum, another figure instrumental in the selling of the Iraq War, has likewise used the scandal to beef up his public standing. The Iraq connection is not a coincidence. That, too, was a sensational tale fed by anonymous government and intelligence officials to a media that, caught up in a nationalistic panic after a foreign attack (a figurative one, in today’s case), swallowed it largely uncritically, while more skeptical voices were sidelined. These parallels are worth noting not just for how striking they are, but for how history was repeated so soon after the media swore “never again” in the wake of the epic fiasco that was the Iraq War. If the media fails to properly reckon with its failures again this time — if the media figures who fanned the flames of panic and innuendo for ratings simply move on as if nothing happened — the risk of something like this happening again is high. This, above all else, is the Trump-Russia scandal’s greatest legacy: the delegitimization of peaceful diplomacy and a lurch to increased hostility in US-Russia relations — developments eagerly sought by the national security “blob” that pushed the conspiracy theories — coupled with new methods to censor and delegitimize political movements challenging the status quo. And most likely, this is only just the beginning. If there is a silver lining to this, it’s the failure of a combined effort between the political establishment, media, and the intelligence agencies to deligitimize and destroy a presidency. You don’t have to like Trump to be alarmed that the last two years has seen the vast intelligence bureaucracy— a deep state, if you will — carry out a public campaign, in concert with a press that has become increasingly deferential to it, to smear and defame an elected leader who challenged its authority and inconsistently rebelled against its foreign policy vision. It doesn’t matter that Trump’s rebellion was, like virtually everything the establishment loathes about Trump, more symbolic than material. The broadly defined national security state took even this minor effort as a threat, and responded accordingly. Imagine what they would do if a president ever tried to abolish the CIA, as proto-neocon Daniel Patrick Moynihan wanted to do in the early ‘90s. Had Bernie Sanders become president — the same Bernie Sanders who has since 2016 articulated a foreign policy vision contrary to the DC foreign policy “blob” and now peppers his speeches with denunciations of the “military-industrial complex” — there is little doubt he would’ve (and still may) face the same sorts of wild conspiracies and accusations led by a rebellious national security bureaucracy as Trump: accusations about his closeness with Russia, whispers about his supposed ties to authoritarian left-wing governments, anonymous leaks to discredit his foreign policy and even justify government investigations. This campaign will have less teeth in the wake of this debacle. There’s one more point to make: the Left was right. Just as left-wing commentators warned about Clinton’s inadequacies, just as they warned about the seething anger and disappointment that helped bring Trump to power, just as they warned the Trump-Russia scandal was a flimsy basis on which to resist Trump, the Left was right to warn reporters and politicians to be careful and skeptical instead of jumping to overblown conclusions. Perhaps next time the Left warns you about something or someone, you should listen.